Written by Jennie on 26 August, 2013 . 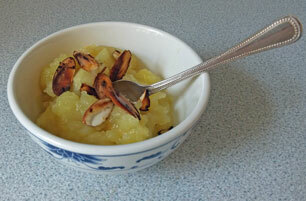 Apple compote – stewed apples—don’t have to be boring! Apples are really good for you. The saying, “An apple-a-day will keep the doctor away has a lot of truth in it. In this recipe I’ve mixed cooking apples with dessert apples. This does two things: it sweetens the often tart cooking apples meaning that no sugar is required. And the dessert apples retain their form, so you get a mixture of textures too. Peel and cut the apples into small pieces. Add your choice of spice. Add a little water to the pan – approximately 1 cm in the bottom of the pan. Bring to the boil. Turn the heat down and cook (usually less than 10 minutes) until the Bramley apples have become a pulp – the dessert apple will still be in chunks. For the almonds, carefully cut each almond horizontally with a sharp knife. It’s fiddly – so please be careful with the knife – but on some days it’s really worth the effort! Place the white sides down in to a small frying pan. Put on the heat. After a minute or two toss the almonds lightly so they flip-over. It only takes a couple of minutes for the almonds to be toasted. To serve, place the stewed apple into a small bowl. If using, place a dollop of natural yoghurt on top. Sprinkle with toasted almonds – or other nuts. The apples can be served hot or cold. For a fuller, spicier flavour, refrigerate the cooked apples the day before you need them.